Chase Briscoe will start his fifth race in the No. 98 Nutri Chomps Mustang for Stewart-Haas Racing with Biagi-DenBeste (SHR) Saturday at Kansas Speedway in Kansas City. Briscoe won his last race in the No. 98 Ford Sept. 29 on the Charlotte (N.C.) Motor Speedway’s roval. Briscoe led 33 of the race’s 55 laps and won by 1.478 seconds. It marked his first Xfinity Series victory. Nutri Chomps joins Briscoe on the No. 98 SHR Ford in Kansas: Nutri Chomps are a 100 percent rawhide-free, vitamin- and mineral-enriched, high-protein dog chew made of chicken and pork skin. Nutri Chomps is one of several product lines by Scott Pet, Inc. Scott Pet is headquartered in Rockville, Indiana, and is a family-owned manufacturer and distributor of quality pet products for more than 40 years. Scott Pet began a relationship with Briscoe in 2016 while he was competing in the ARCA Series. Briscoe will be joined in the Kansas field by SHR teammate Cole Custer in the No. 00 Haas Automation Ford Mustang. The No. 98 Ford makes its 12th and final appearance of 2018 at Kansas. Aric Almirola, Kevin Harvick and Briscoe have shared driving duties. Harvick won Feb. 24 at Atlanta Motor Speedway. Briscoe also won the July 18 NASCAR Camping World Truck Series race at Eldora Speedway in Rossburg, Ohio. 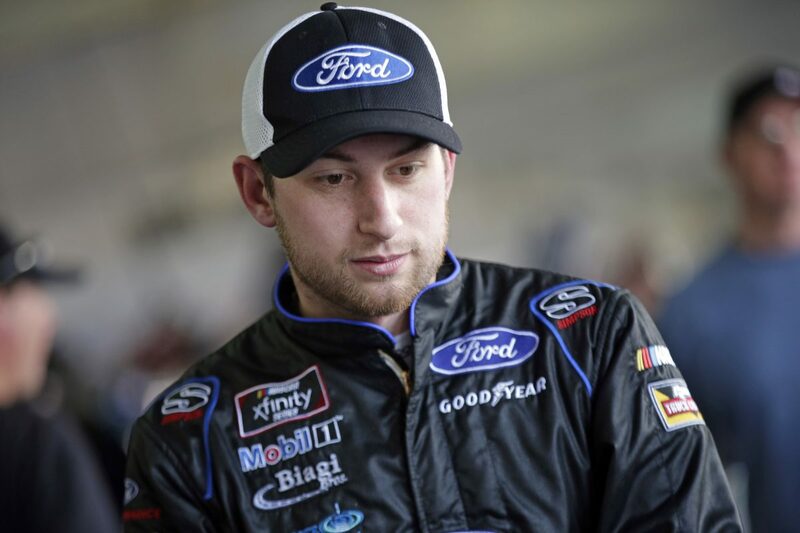 In 2017 Truck Series competition, Briscoe earned four poles and won the season-ending Ford EcoBoost 200 at Homestead-Miami Speedway. Briscoe’s 10 top-fives and 14 top-10s enabled him to make the Truck Series playoffs, where he finished sixth in points and scored the series’ rookie of the year and most popular driver awards. Briscoe won six races en route to the 2016 ARCA Series championship. The 23-year-old native of Mitchell, Indiana is a third-generation driver. His grandfather Richard Briscoe is a legendary Sprint car team owner, and his father Kevin Briscoe raced Sprint cars for more than 20 years and won more than 150 feature events. Briscoe’s first time behind the wheel of a racecar came in 2001 in a Quarter Midget. In 37 starts driving 410 Sprint cars, Briscoe racked up eight top-fives and 17 top-10s, including a win in the last race of the season, where he broke Jeff Gordon’s record as the youngest driver (13) to win a 410 Sprint car race. Has the Charlotte roval victory sunk in after a few weeks?